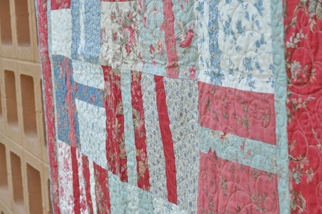 On the never ending quest to document the quilts I have made. 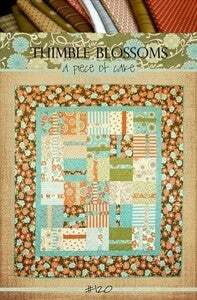 Today’s quilt roll is a quilt made from a Thimbleblossoms pattern, Piece of Cake using French General fabrics. I loved how quick this quilt went together and it showcases the fabric nicely without cutting the layer cake into a bunch of little pieces. 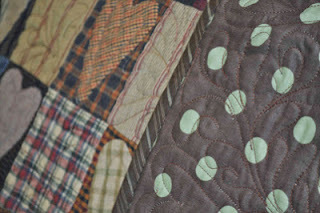 get all my quilts documented. 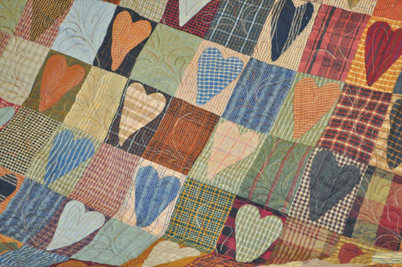 Plaid binding cut on the straight of grain to form this checkerboard like binding. I made Piece of Cake (#1) and in no time Camille has 2 more piece of cake patterns. 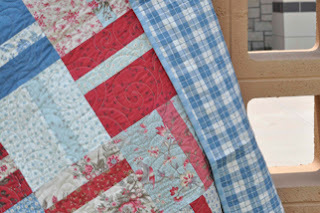 I can’t keep up with my posts about the quilts I have already made much less all the quilts I want to make. If there is therapy for this quilt sickness, I don’t want treatment! 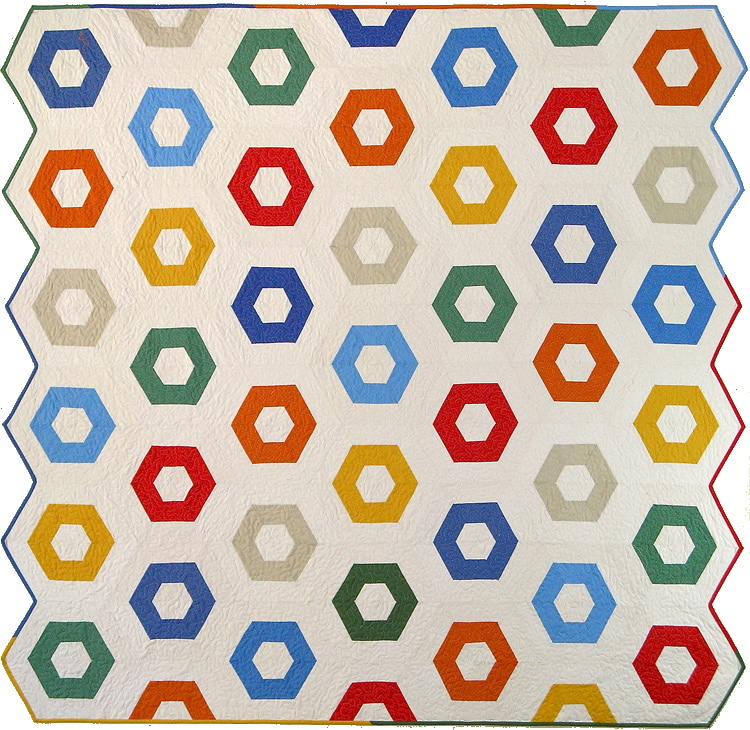 I do not always give my quilts names but this one is an exception. 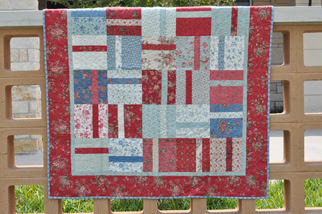 It did not earn it’s name because of any bumps or scrapes that occured during the quilting process. It earned its name because of the colors… Black and Blue. I know that is lame but I am easily amused. my black, blue and white fabrics. Can you imagine this was PRE- Jelly Roll days? You might as well call it Pre-historic. Once I had a big pile of strips I knew exactly what I was going to make. As you will see with many of my quilts, I don’t make them for any certain room or to match that perfect bed emsemble. I make them becasue I enjoy the process and like playing with color. 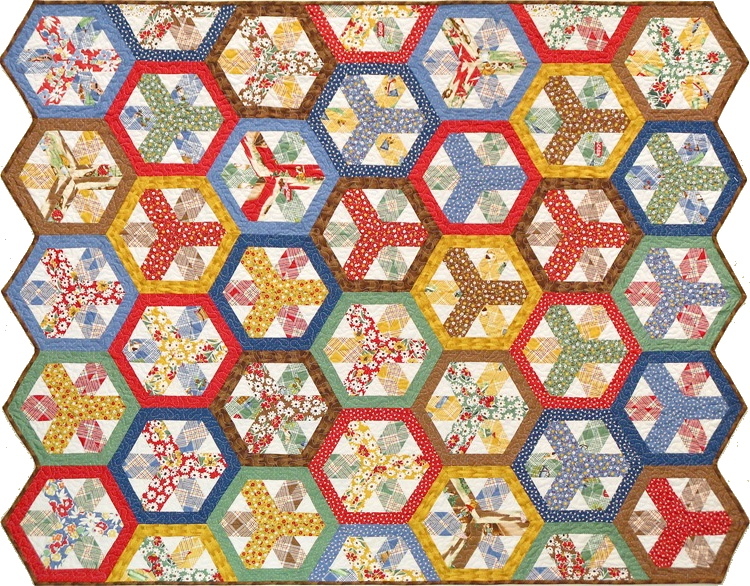 The log Cabin block is one of my all time favorite blocks and the pineapple block certainly falls in my top ten. I used the Pineapple Ruler by Possibilities which makes the process so much better. Shazam, I mitered the striped border to meet so nicely in all the corners until I got to corner 4. Corner 4 is shown in the first picture. My motto, if it doesn’t match…. piece another block and throw it in the corner. 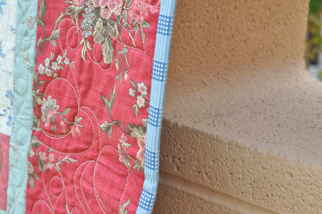 It is amazing how many of the fabrics look brand new and just a few have faded over time. 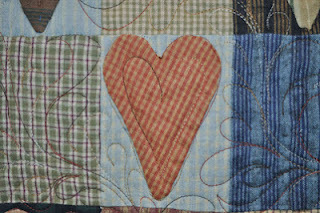 I love my large plaid binding cut on the bias. This was over 15 years ago. I was such a rebel or a trendsetter, not quite sure which one. No comments please! This fabric was way before it’s time. We couldn’t give it away then. what fabric every one wanted. We couldn’t get any more. I guess that is one of those things that never changes. 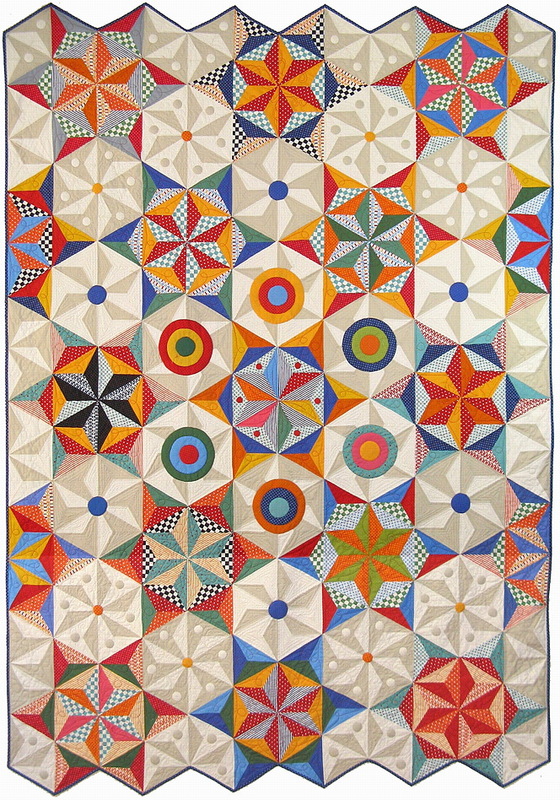 Thanks for listening to me carry on about quilt # 2 in my Quilt Roll.